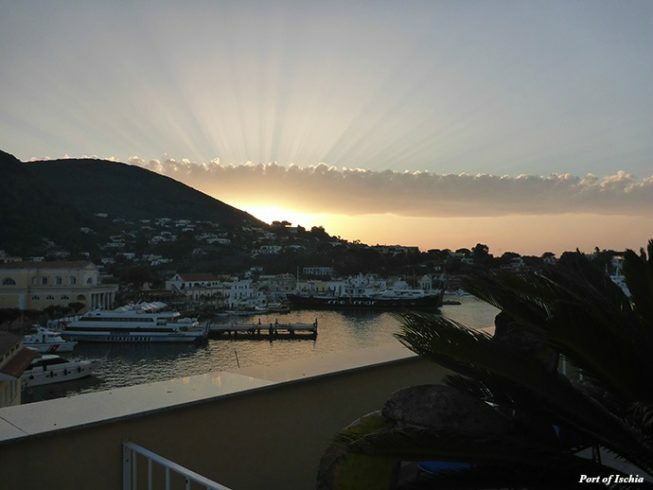 We arrived on the island of Ischia, very eager to meet with our newest acquisition, Mio Amore. Roger and I were on a mission to sail this 65-foot Sunseeker Manhattan across the waters and lead it towards its new home in Birgu to join the rest of the Azure Ultra fleet. So, as we prepared for the final handover of the yacht, we decided to see what the island had to offer – and boy were we impressed! Isola d’Ischia is situated just north-west of the Gulf of Naples, and is one of a huge volcanic chain of islands found in the area. The island has numerous hot water springs, many of them with bathing facilities, which unfortunately we didn’t have opportunity to try this time. We did however take a bus tour around the island, enjoying the lush, semi-tropical vegetation and sampling the incredible fruit which is not only delicious, but absolutely huge! The island is gorgeous, with lovely shopping areas and quaint restaurants. There are a few harbours around and several little bays, providing many an ideal spot where to drop anchor. Of course we were able to sample the local fare, and not surprisingly the pizza and pasta dishes are so tasty. Fish and seafood feature in every eatery, fresh off the fishing boats. The locals love their steak, and I don’t think we’d ever seen a T-bone that size anywhere! My favourite thing was the absolutely scrumptious doughnuts – little warm twists rolled in caster sugar, and they’re freshly available almost everywhere. Oh, and the ice-cream – no explanation needed. After receiving the keys for Mio Amore just before lunchtime, we decided to quickly buy a few provisions, fuel up and make a start on our trip back to Malta. 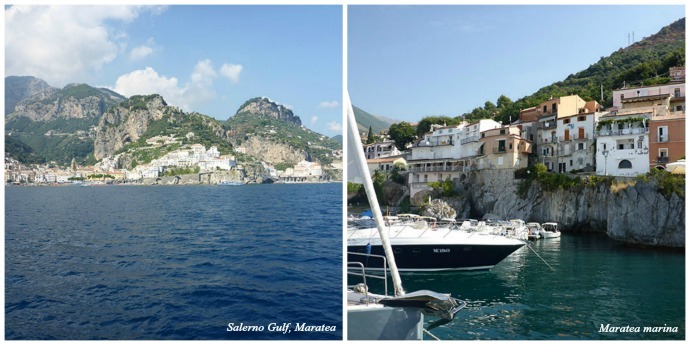 We headed towards Capri and soon got a feel for the most comfortable cruising speed. We had planned the journey but decided to stay open minded about making any changes. One is truly spoilt for choice along the Italian coastline, with an array of marinas in so many gorgeous towns where to stop over. Within an hour we had passed Capri on our right and Sorrento point on the left. We decided to be sensible and hug the coast for a while, which meant we were able to enjoy the fabulous views along the Amalfi coast. 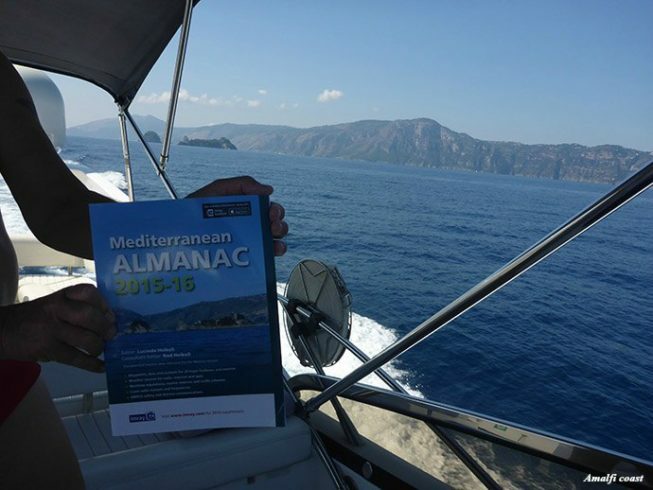 At one point we realised that the actual view we were looking at was identical to the cover of our Mediterranean Almanac! We had been told by Mio Amore’s previous owner that Maratea was one of their favourite places, so we decided to head there to spend the night. We called ahead to check that there was a berth available and navigated straight across the Salerno Gulf. The views were spectacular all the way. 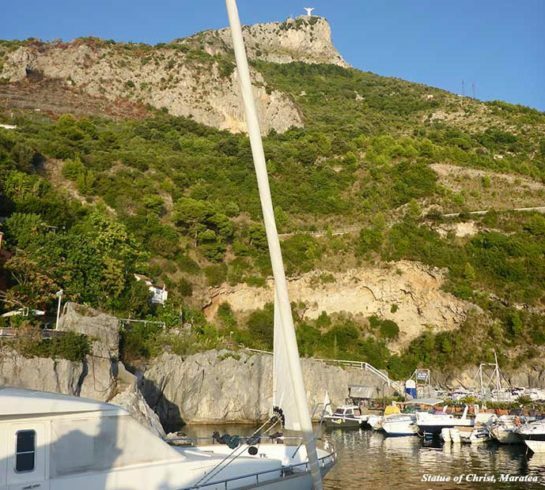 On the way there, we kept our eyes peeled for the white statue of Christ which stands at the top of the mountain directly above Maratea. The entrance to the marina isn’t easily visible until you’re virtually there. It’s absolutely gorgeous, with the pretty village climbing up the mountain and the stunning colours of sunset. By then we had been travelling for about 6 hours and had covered 107 nautical miles. That evening, we had a splendid dinner in a tiny restaurant with a secret entrance up an alley way situated just off the waterfront. There was a little Italian mamma in a flowery pinny at the door, and the lovely smell wafting out was all the temptation we needed! Instead of bread rolls, they brought us these divine little savoury biscuits with fennel, which were especially tasty dipped in olive oil. The fresh pasta with cream and local mushrooms was so simple and incredibly flavoursome! There are some beautiful churches and interesting ruins in the area, and it’s possible to drive to the statue at the top of the mountain. We certainly hope to spend more than just one night here on our next visit so that we can have a proper look around. 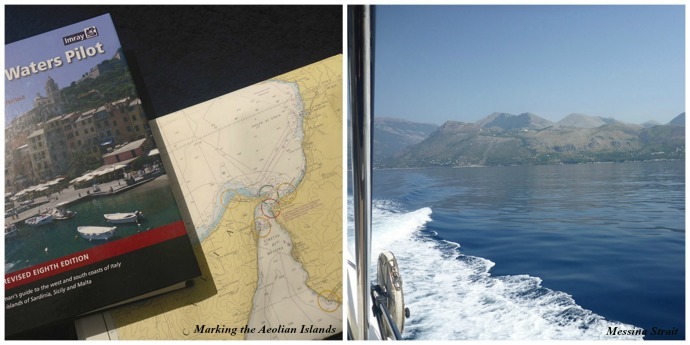 After refuelling Mio Amore, we proceeded to set off at about 11:30am, heading straight out towards the Messina Strait, passing Scalea, Cirella and Paola. We were very tempted to stop in at Tropea, after hearing how nice it is by a friend who had recently visited the area. It was much too early to stop off, however, so we continued on while the sea conditions were so perfect. We were also trying to establish the most economical cruising speed and range, and decided to head straight for Riposto in Sicily. Passing through the Strait of Messina, we could see that the white sandy beaches of Sicily were still busy with holidaymakers, even though it was quite late in the day. Sicily has so many fantastic places to visit, and the Aeolian Islands are only a short cruise away – a fabulous destination for a few days. 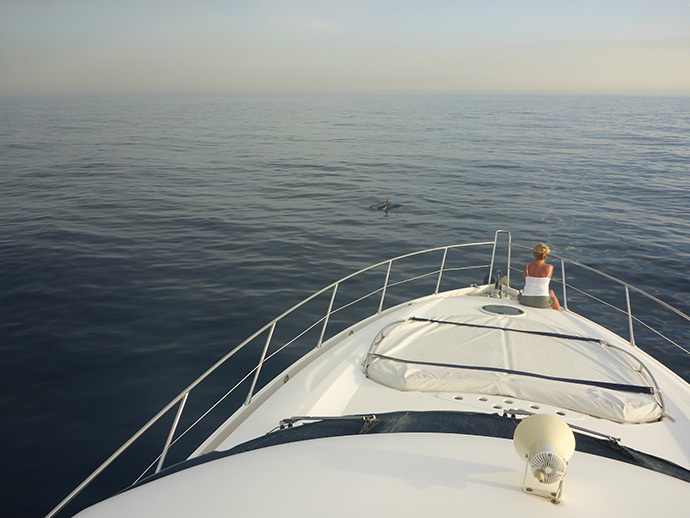 Coming up towards beautiful Taormina, we encountered dolphins. There were hundreds of them in separate pods – and such a magnificent sight to behold! We drove slowly around the Bay of Taormina for a while, and had a look at some of the superyachts anchored up. It’s an amazing place to spend a night or two, going ashore and taking a taxi to the top. The shops and restaurants are incredible, and the views simply breathtaking. In the summer there are ongoing festivities. The granita – a frozen fruit dessert traditionally served up in a brioche bun – is just wonderful! 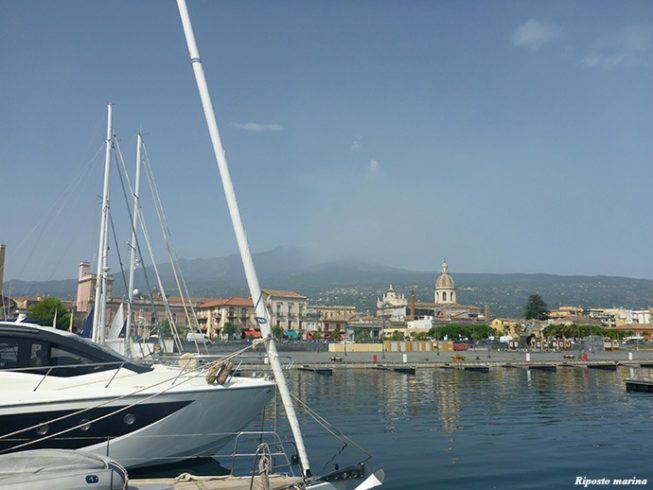 We made our way to Riposto Marina: the sun was setting by the time we moored up under Mount Etna, which was puffing and blowing as usual. We had been travelling for just over 8 hours, covering 147 nautical miles, and were feeling rather tired. There is a good bistro at the marina and we managed to get a bite to eat before calling it a day. We snacked on traditional Sicilian nibbles – little pastries filled with cheese, pumpkin and herbs – and of course crusty bread and oil before tucking into a hearty dish of homemade ravioli with fresh tomato sauce. After we woke up, we were especially looking forward to breakfast – those big buttery croissants packed with apricot jam that the Sicilian bakeries churn out every morning. Following a routine checkup by the Marine Police, we eventually set off. 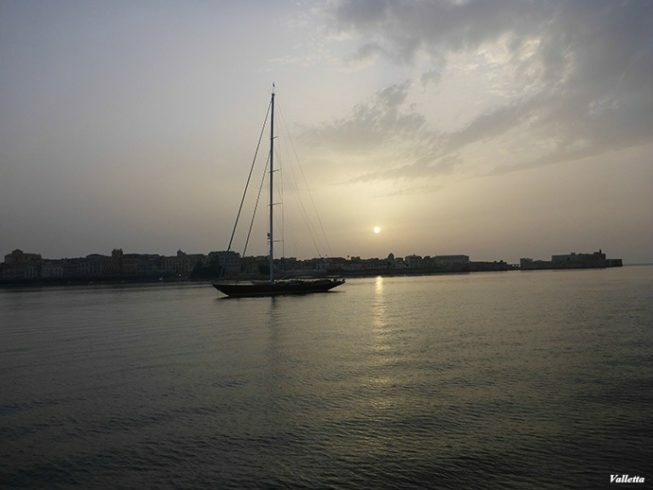 Our plan was to travel directly through to Malta, as the weather reports were not looking great for the next few days. The sea was lovely for the first 20 miles; then it began to change, and very quickly too. Within the next hour the wind was howling and the waves had grown much bigger. As we passed Syracuse (one of my favourite places), we decided it was safer to go into the bay and anchor up for the night. It was apparent that others had had the same idea, as there were more boats than usual in the area. We only covered just over 50 nautical miles that day. By 8pm the bay was calm and very peaceful. Being a Saturday night, we could hear all the festivities going on. However, we were without a tender (dinghy), so we couldn’t go ashore. So in true Maltese fashion, we made ħobż biż-żejt for dinner and had an early night instead. We were up early and left before 7 o’clock. The sea was flat and the sun had just risen. 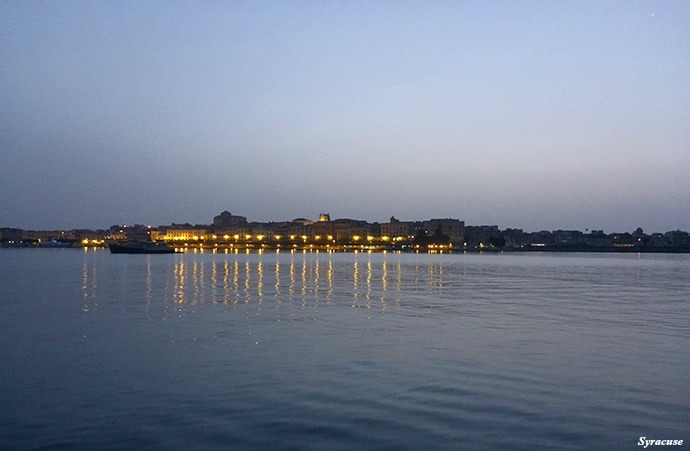 We took it easy and were back in Valletta in 4 hours, having travelled the last leg of 84 nautical miles without seeing a single boat. 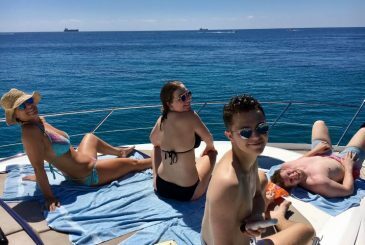 By that evening, the bad weather had hit Italy and Sicily with giant hailstones – so we’d had a lucky and safe escape back to calm Maltese waters! We’ve since given Mio Amore a bit of a makeover, replacing all the soft furnishings, bed linen and kitchen equipment for our guests. The on-board amenities have also been upgraded to include a coffee machine, kettle and toaster, and everything else required to prepare everyday meals. The yacht is also equipped with a freezer and fridge as well as a 4-plate hob and microwave oven. On the flybridge is an excellent grill, perfect for al fresco dining, and an extra ice box for chilling drinks. Mio Amore is now completely ready to board with all the necessary luxuries and amenities, and in fact we’ve just experienced a fabulous week’s charter aboard with a family of six adults. She’s extremely spacious and comfortable, and the extra room for the crew gives our guests complete privacy. 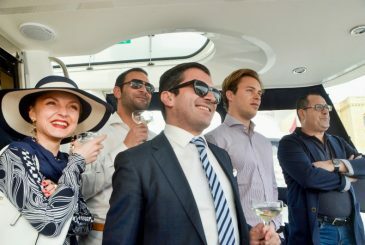 And when celebrating in style, the two ice makers on board are a real bonus, keeping a constant flow of Prosecco nicely chilled for popping open! Check out the full range of features aboard the Mio Amore Sunseeker yacht. 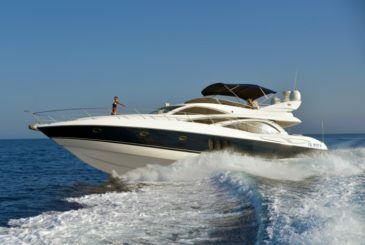 Luxury yachting opportunities uniquely tailored to your specific requirements await. Discover Azure Ultra's fully crewed charter options.